Heavenly blog! : No. 1727: Jimmy Swaggart and his teaching about the cross are cruel! No. 1727: Jimmy Swaggart and his teaching about the cross are cruel! Jimmy Swaggart and his teaching about the cross are cruel! 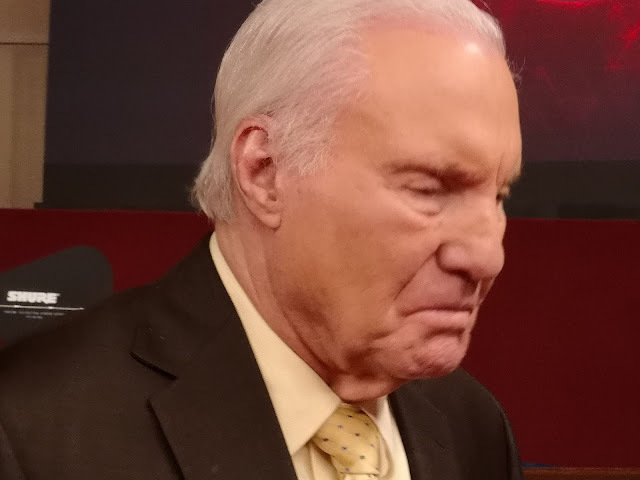 Picture of Jimmy Lee Swaggart. Photo: Jan Kåre Christensen. I have tried to get into what Jimmy Swaggart proclaims and teaches about the cross he eats after his own testimony received a special revelation about this in 1997.When Jimmy Swaggart stood up and began to proclaim after the fall in 1988.Then, in his first speech, he mentioned that Moses was disobedient to turn on the Rock that is Christ twice.God spoke to Moses that he should first beat second time.Both times Moses hit when he did not follow God's order. This is how Jimmy Swaggart has now joined, claiming that he has received divine revelation in 1997 about the Cross. This, of course, is nothing but a strange gospel that Jimmy Swaggart comes with.Jesus once sinned sin and this we receive once in faith.The rest is a development and an ever stronger and better revelation of the same thing we received in salvation.Therefore, Paul asks us to have the enlightened eyes of Christ, not "see" Christ's death repeatedly as if it was important and necessary. This is strange learning that Jimmy Swaggart tries to lead into the church of God.Is it "necessary" that we get an experience of the second time? Or was not the first time we came to Christ good?Picture of the advertisement in the magazine Evangelist der Swaggart writes right out that he received a "special" revelation in 1997, which of course was either from himself or seductive and misleading spirit powers of the evil one. The scripture is ready here, we will believe once. Afterward, we will develop, be born and be preserved in that faith. But what about Evangelist Jimmy Swaggart proclaiming an "extra" revelation of the Cross? This is a great misunderstanding where one believes the lie (proclaiming an "extra" revelation of the cross).The Apostle Paul would not even believe in an angel who revealed things to him if it does not match the scripture, so it is most important to us, what does the scripture say.From my Bible remarks Galatians 1: 6. It is astonishing that you have soon turned away from him who has called you by the grace of Christ and has gone over to another gospel.Paul goes to a strong assault against this preaching. It can not be united with true Christian faith.It is a "different gospel" which separates them from Jesus Christ. In other words, there is the life of the galatians. God is zealous about his son's salvation at Calvary and does not endure that anyone speaks falsely about Jesus' salvation. The Jews preached was a devilish lie. Throughout the church history hasThere have been different variants of "another gospel". Common to all such preaching is that it is not based on the word of the Bible alone, but blends humanity's logic and thought into it.Another gospel undermines trust in the word of God and thus to God Himself. It leads to idolatry. For man himself takes God's place. That is why the devil's gospel. 7 But there is no other gospel; Only those who confuse you and want to distort the gospel of Christ.The Jews also spoke of the grace of God, but they spoke not only of the grace of God. There was something that was added to God's grace. It was God's grace plus something more. And it was this "something more" that destroyed the proclaiming of grace. The word of God says, "My grace is yours". If anything is added then it is no longer enough and if something is deducted, it is not enough. That grace is enough means that it is sufficient. The Jews proclaimed grace plus deeds. But it is not so. For if God save us for something we have done, then God is in debt to us. Yes, Rome. 4.4 says that "He who has works does not pay him the salutation of grace, but as an obligation. "But where was the teaching of Jesus' atonement for the sin of humanity among the Jews? Well, it actually belonged. They said that the life and death of Christ's deputies would replace what was lacking in the fulfillment of the law. Such a gospel could sound logical. That's right with our usual mindset. Will not this work for good deeds, may it be? We are doing the best we can, and then Jesus will take on what is missing from us - and that's all bad. No, that's not the case. It is this as Paul calls "another gospel." One has said this so that it is "this gospel of this world" or whether you want "the religious hops gospel". water and lead others unsuspecting in the same, therefore his "new" doctrine as he received in a special revelation back in 1997 should be warned. Who does this "new" preaching? Much, here are some things.1.) It creates a distinction between us unbelieving believers. Those who follow Swaggart support him, then they also support his cruelty. The scripture says when a blind man leads a blind they both fall into the ditch. 2.) It is always the unprepared and newly saved who are always the most victims of such a peril. They support Swaggart, and are not aware that they also carry a lot of scorn on the "purchase." .3.) Jimmy Swaggart opens up for foreign learning, he also opens up demonic activity. 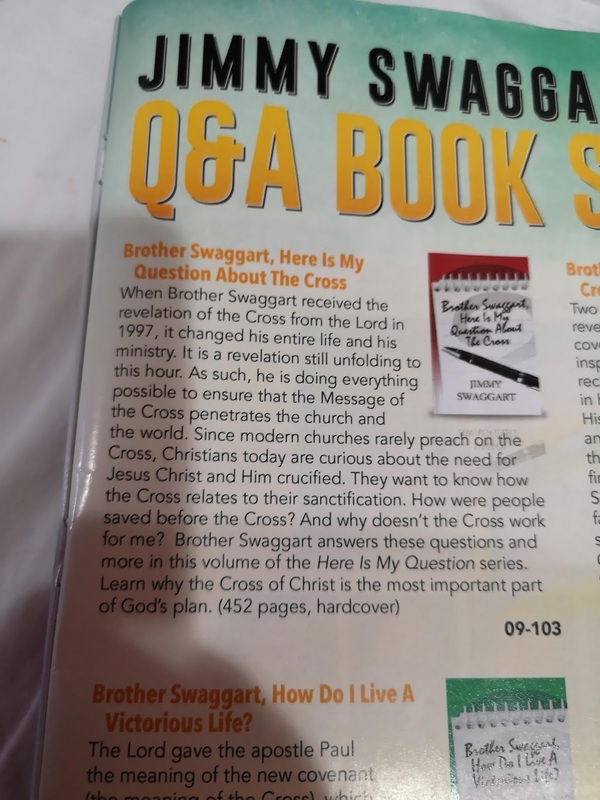 This is very dangerous and need to warn against when Swaggart really has so much to do with both singing and preaching. 4.) In such an excessive emphasis on the Cross, it will and will at the expense of other truths in the word of God. Do you have 100 kr. and spend up $ 50 if the money is something that turns out to be a bad purchase, so follow the rules. 5) Jimmy Swaggart is disobedient to the Lord and his words then one must expect his "investigators" to be that too. This is "contagious" and when I Seeing that his wife Frances acts as Bible Bible teachers, I see what negative and bad fruits Swaggart's Witnesses have given.6.) This is no way an attack on Jimmy Swaggart's past. This article does not deal with its character or past sins, but it is about his preaching of the cross being presented on cable television through the secular BET network, among other things. As well as other stations.7.) Swaggart writes: "This service is of God. Therefore, we have a mandate from the Lord. This mandate is the World Evangelism and also the proclamation of the true gospel," The Message to the Cross. "In other words, the Church must be brought back to the Cross. The Lord has given me this task / service to pass on this. This is one of the reasons why the Lord gave me this great revelation of the Cross in 1997." 8.) " The tragedy is almost all Christians believe they know everything about the cross. The truth is that this generation of Christians knows almost nothing about God's words, especially about the cross that is essential to their sanctification. These Christians can be released only by the "cross." Swaggart says, "The believer is making the cross the subject of his faith, and then the Holy Spirit can do his work our purpose with our faith. "The Bible says that the Lord Jesus is our goal. Swaggart is all the time, this revelation he received in 1997 does not bear any fruits of being from the Lord.10.) Jimmy Swaggart has a wonderful song / song of praise, so it is with a sad heart that I must note that Brother Jimmy Swaggart not only sinned with the prostitutes and whores he has prayed for God and all for forgiveness. But have come in or out in a siding in the learning area based on the word of God! Final comment: Once I have warned against Jimmy Swaggart and his preaching of the cross that he believes he has received a revelation in 1997. As again makes his preaching not healthy and biblical here. Then there is also a great hope and wish that he should publicly discourage this teaching as he did with his "sinful problem"! Swaggart is the way I see it a resource out of the ordinary. He can sing and preach as nobody else does. In that case he will first be guilty of sin. Then he gets a settlement with this problem. So it's being led by villages of foreign learning. Here, brother and Evangelist Jimmy Swaggart needs to be humble, go by themselves. Pray for God and people for forgiveness and be allowed to begin again. Room. 16 17 But I urge you, brethren, to keep an eye on those who carry the punishment and the offense against the doctrine that you have learned and go away for them; 18 For these do not serve our Lord Jesus Christ, but their own belly, and by their sweet speech and their beautiful words, they die the hearts of the simplicity. 19 For the word of your obedience has come to all; Therefore I am looking forward to you, but I wish you to show good and clean for evil. 20 But the God of peace will hastily crush Satan under your feet. The grace of our Lord Jesus Christ be with you! No. 1726: Jimmy Swaggart and The Cross!